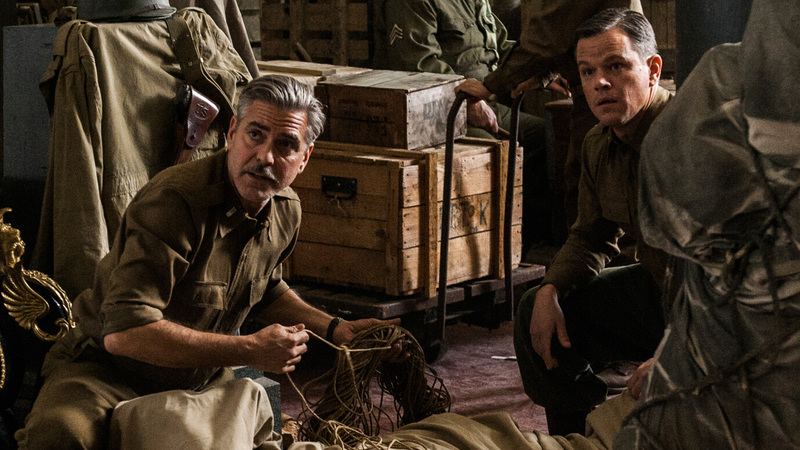 As I watched The Monuments Men, the new George Clooney film about trying to save stolen art during World War II, the word that kept coming to my mind was “jaunty”. Yes. It’s a very…jaunty movie, with a, well, jaunty plot, and jaunty characters played by jaunty actors and all backed by a very jaunty score, a wonderful bit of musicality by the wonderful Alexandre Desplat that kept reminding me of the Colonel Bogey march from The Bridge on the River Kwai—it’s that jaunty. Is The Monuments Men any good? I can’t say that exactly. But I can say that it’s very enjoyable and entertaining enough and rarely drags. But it’s really not a lot more than that as much as it tries to be. The screenplay by Mr. Clooney and Grant Heslov (who has done good work in such films as Good Night and Good Luck and The Ides of March) is little more than a series of episodes. At the same time, I’m not sure exactly what all these episodes really add up to in the end. In fact, by the time it was over, I wasn’t really sure what the Monuments Men, the actual real life counterparts, did in saving stolen art that wouldn’t have been done had they not been around. It seems like just about everything that happened in the story would pretty much have happened the way it did with or without their intervention. Even Clooney and Heslov seem to suspect this as they add on a ticking time bomb of a climax trying to get some art out of a cave before the Russians get there. I’m not saying this didn’t happen exactly the way it did here, but it feels more like a creation of the writers to come up with some sort of tension when there really wasn’t much of it in the first place. It’s a fun bit, but is really milked and ends up coming across about as realistic as the ending of Argo. And then there are all those speeches given by Clooney’s character Frank Stokes (yeah, he not only co-wrote it, he stars in it as well) trying to justify what they did and that saving art is not only just as important as saving a human being, it’s actually kinda more important (maybe, maybe not, I don’t know, it’s a bit mudded as far as I’m concerned). The issue here is that every time he gives one of these speeches, he seems more and more desperate in his reasoning and becomes less and less convincing. Of course, in full disclosure, I’m of the camp that says a thousand Mona Lisa’s can burn if it would cost one life to save it. We can make new art that will equal old smiley face, but a particular human being can’t be replaced. So every time an officer refused to help Stokes in his quest, I kind of sympathized with the officer (or as one of them put it, and I paraphrase, “I’m not going to write home to a soldier’s mother and tell her that her son died because we tried to save a steeple”). The directing by Clooney (yes, he not only co-wrote it and stars in it, he also directed it) gets the job done. And it has a fun (or as I put it earlier, jaunty) cast with Matt Damon, John Goodman, Jean Dujardin, Bob Balaban, Bill Murray, Hugh Bonneville as the men and Cate Blanchett as the French partisan who helps them (I guess there weren’t any French actresses available at the time). True, it’s a white bread acting approach to filling the roles as opposed to something like The Dirty Dozen (in The Monuments Men, everybody is cool; in The Dirty Dozen, they’re insane psychopaths), but, hey, whatever gets an audience into the seats. However, if you want to see perhaps a slightly more profound movie that takes a few more chances about the same subject matter, I would strongly recommend checking out The Train, a movie about a German trying to take art out of Paris that meets resistance in the Resistance. It stars Paul Scofield and Burt Lancaster and is a far more interesting film. I don’t know what it is about Nick Offerman, but whenever he comes on screen, I just sort of relax. I don’t know what it is. Maybe it’s because he always plays these same calm teddy bear types, but he’s sort of the father I would always have wanted even if no one else on the screen, including his kids, understands how lucky they are. Offerman is actually more of a minor character in the new teen com bromance rom com, Date and Switch. But he’s a welcome addition as are Megan Mullaly and Gary Cole as the other parents who haven’t a clue even when they do. The story is actually a variation on American Pie in which two BFF’s, Michael and Matty, vow to lose their virginity before prom but Matt throws a spanner into the wicket when he reveals to Michael that he’s gay. So now, not only does Michael need to do the dirty deed, he has to figure out what he wants to do about his friend, and Matty has to figure out what he wants to do about being gay. Date and Switch is cute and charming. It’s basically almost nothing but staircase wit (the screenplay is by Alan Yang) with the champagne quality of the dialog and all the frothy bubbles it emits getting more than its fare share of laughs. And that’s certainly nothing to sneeze at. At the same time, the wit is backed up by staircase acting. And though this gives the movie many enjoyable and entertaining moments, it’s actually not as great a combination as you might think, because Nicholas Braun as Michael and Hunter Cope as Matty deliver the clever dialog as if it had been rehearsed to within an inch of its unnatural life (the direction is by Chris Nelson). I mean, they’re good, they’ve very good. The problem is that they’re too good. With the result that though everyone tries their damnedest, they just can’t quite reach the delirious naturalism of something like Superbad. And it probably doesn’t help that the lead actors look like they’re about to graduate from college, not high school. And I’m not sure I’m comfortable with Yang going out of his way to make sure the audience knows that Matty may be gay, but he’s really no different than anyone watching and only wants to live his life as a stereotypical straight person, looking down on most other gay people and the bars they attend. There are also various twist and turns along the way (none of them particularly surprising or unpredictable) and the whole things works it way out with a pleasing formulization. It may not be as much fun as the foam party the characters attend at one point, but it’s not a bad night out either.